Need a quick, on-the-go meal for busy weekdays? 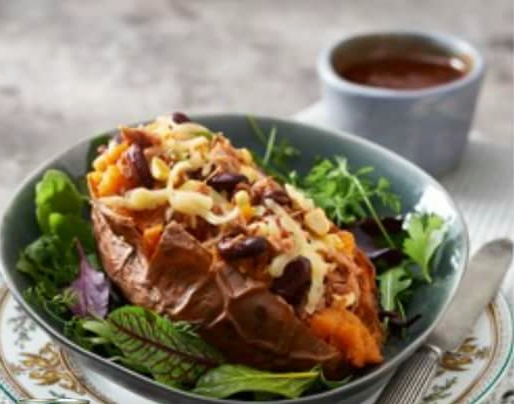 Our Baked Sweet Potato and Sardines can be made in small portions, refrigerated, and enjoyed during the week - making for a convenient and nutritious lunch box meal! Baked Sweet Potato and Sardines. 1⁄2 small red onion, finely chopped 30 ml oil. 2 cloves of garlic, crushed. pinch of cayenne pepper, optional. 1 x (410 g) can diced tomatoes. A handful of fresh baby salad leaves and rocket 100 ml crème fraiche or cream cheese (optional) 50-60 ml sweet chili sauce few sprigs of fresh coriander. Preheat the oven to 180°C. Wash the Sweet potatoes, brush with oil and place onto a baking tray. Bake for 30-40 minutes, or until the sweet potatoes are cooked through and tender. Remove from the oven and cut open lengthwise. In a frying pan, fry the onion in the oil, together with a small pinch of salt, until soft and translucent. Add the garlic and fry for a further minute. Add the remaining filling ingredients, except for the mozzarella cheese. Heat through and set aside. Scoop out a 1⁄4 of the flesh from each sweet potato, crush with a fork and add to the filling. Scoop a 1⁄4 of the filling into each sweet potato, and then top with the grated mozzarella cheese. Place the potatoes back into the oven for a further 15-20 minutes, or until the filling and potatoes are piping hot and the cheese has melted. Place the potatoes into serving bowls, top with the crème fraiche (optional), a little sweet chili sauce and a sprig of coriander.